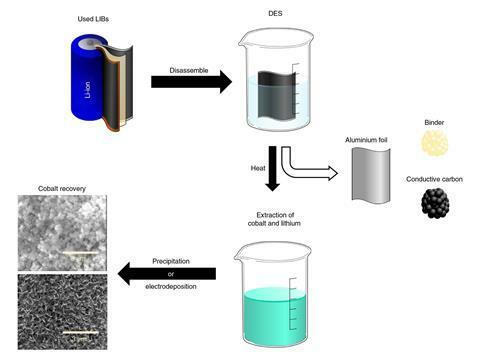 Eutectic solvents can extract lithium and cobalt from old battery cathodes in an environmentally friendly process, new research shows. The findings may play a role in tackling the mountains of waste set to follow when today’s consumer electronics and electric vehicles reach the end of their useful life. Cobalt typically makes up around 15 weight percent of lithium ion battery cathodes. The price of cobalt lurched upwards in recent years, and its supply can be problematic. A couple of companies dominate its extraction from mines in the Democratic Republic of Congo, a country notorious for its political instability. The process developed by Babu Ganguli and colleagues at Rice University deploys deep eutectic solvents. 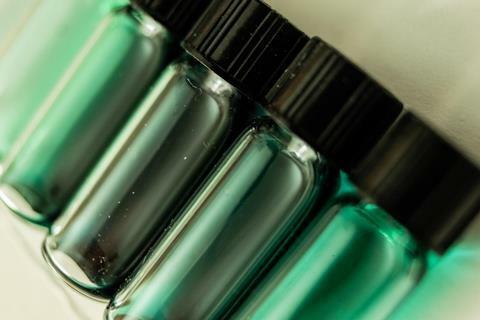 Deep eutectic solvents are eutectic mixtures of hydrogen bond donors and acceptors that are often cheaply obtained, easily prepared and made of relatively nontoxic and biodegradable solvents. In this case, the solvent combines choline chloride and ethylene glycol. And it works on multiple cathode materials, including lithium cobalt (III) oxide (LCO) and lithium nickel manganese cobalt oxide, to give Co3O4 – a common starter material for making more LCO. The process begins by adding one gram of the cathode waste to five grams of the solvent before heating it to around 130°C. After around one hour, the colourless solvent mixture turns blue, indicating that cobalt is coming into solution. To recover the lithium and cobalt, the team then apply an electric current to encourage the metal ions to deposit on a substrate. 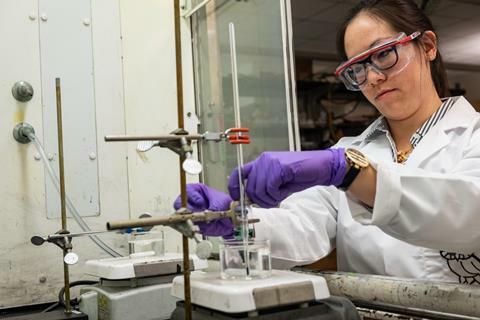 They also found that adding sodium carbonate works as an alternative recovery approach and precipitates the lithium and cobalt as salts, which can then be filtered out. ‘The solvents we use are very environmentally friendly and we managed to recover more than 90% of the cobalt and we managed to recover more than 90% of the cobalt,’ says Ganguli. So far, they have only run the process at lab scale. Ganguli says the costs involved and the amount of solvent that is recoverable after each cycle will need to be determined at pilot scales to work out its economic viability. The most popular way to recover these valuable battery metals in industry is to use pyrometallurgy, which incurs high energetic costs since it requires temperatures of 1,400°C or higher. Another option is hydrometallurgy, but this involves hydrochloric, nitric and sulfuric acids, which can pose a danger to workers and the environment. ‘Our method is sustainable. Once you leach out the metals and recover the metal ions, the leftover solvent is also recyclable,’ says Ganguli. Around four out of five grams of solvent can be recovered after each cycle of the process. It was aqueous sodium carbonate and not aqueous sodium chloride which was used to take the cobalt out of the DES and into a solid. Nice article. One question: the formula for cobalt oxide is written as CO3O4 and should it not be Co3O4. Thanks, Clifford! We've corrected the story.